Summary: Allison Park is an open space area bordering the beach at 64th and Collins Avenue. The beach adjacent to the park is considered an important nesting habitat for the threatened and endangered loggerhead, leatherback, and green sea turtles. The City of Miami Beach will work to transform Allison Park into an ADA accessible park with an Eco-Walk that will educate residents and tourists about the local coastal ecosystem and the sea turtles nesting on Miami Beach. Educational exhibits will specifically address the conservation and protection of sea turtles and will include interpretive signage and pre-cast replicas of life-size sea turtles. The exhibits will be tactile and engaging for a diverse array of park visitors, regardless of age or ability. The Eco-Walk Project will also include vegetation plantings along the dunes to help block artificial coastal lighting that could negatively impact the sea turtles nesting and hatchling survival. 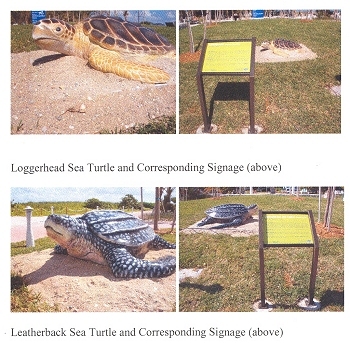 In addition, the City of Miami Beach will fund the replacement of the existing lighting in Allison Park with turtle sensitive lighting in order to minimize negative impacts of beach-front lights on nesting beaches. The City will also fund landscaping and irrigation, and the development of a recreational path along the western edge (upland side) of the sand dunes.